Mohamed Hilal Group UAE is conducting latest walk in interview at Dubai for hotels jobs in Abu Dhabi. Its a free and direct recruitment by the company. * Ideal candidates must have UAE casual & fine dining background experience. * English communication skill is mandatory for every position. However, Arabic is advantage. * Be polite, positive attitude, giving respect to customers and most importantly a smile on your face ?? . * Age not more than 32 years old. * Job location will be Abu Dhabi. 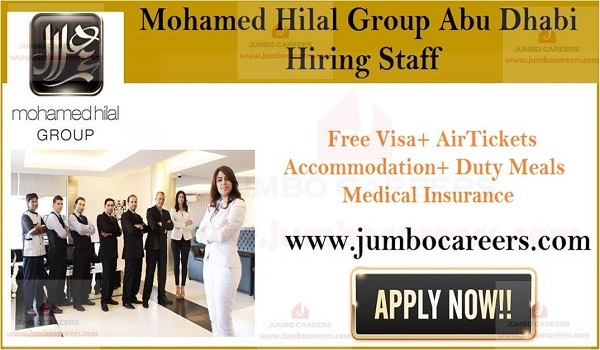 Candidates interested for Hotel jobs in Abu Dhabi may attend the latest walk in interview for Mohamed Hilal Group jobs Abu Dhabi in January 2019. Location : 6th Floor, Jood Palace Hotel, 36-A Street Off Al Rigga Road, Near Al Rigga Metro Station, Deira, Dubai.